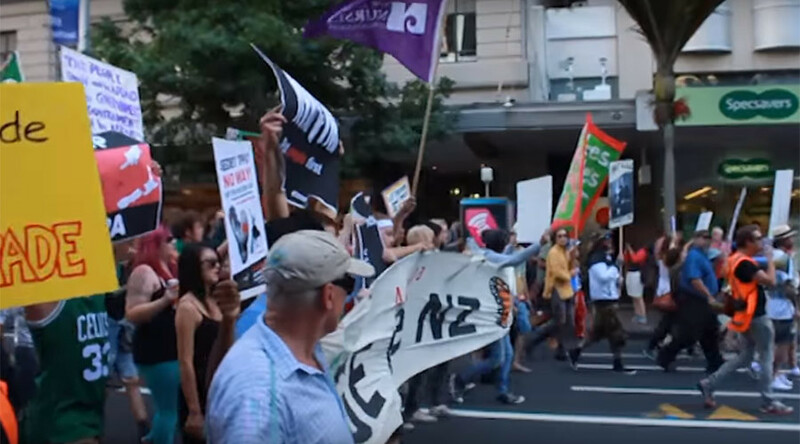 A group of around 1,000 activists protesting against the Trans-Pacific Partnership (TPP) have blocked roads in Auckland, as the participant states’ delegations gathered in New Zealand to formally sign the controversial free trade agreement. The TPP agreement, hailed as the “biggest trade deal in a generation,” was signed in a ceremony attended by ministers from the 12 Pacific Rim countries at Auckland’s Sky City Casino, to the dislike of hundreds of protesters. Ahead of the signing, activists gathered on Aotea Square and set out on a march through the streets to SkyCity Auckland, where they were met by dozens of police officers outside the venue. Others staged a sit in at the intersection of Federal and Victoria Street, blocking traffic, to protest a deal that will now take up to two more years to ratify. Another large group sat down at the end of Hobson Street, blocking entrances and exits to the southern and north-western motorway, while another group stopped traffic at the Fanshawe Street entrance and exit to the Northern Motorway. Police have warned demonstrators to move out or face arrests but have refrained from coercive action. Activists oppose the agreement arguing that it will lead to job loss, stagnant wages, and increasing inequality among other negative consequences for workers. They also argue that TPP will likely protect the rights of large investors and corporations at the expense of workers. Protesters are also worried about currency manipulation, environmental and health protections, food safety, and internet privacy. “New Zealand is proud to be involved in this whole process... I want to acknowledge the courage and vision of my fellow TPP leaders,” he said. The Trans-Pacific Partnership agreement reached in October covers 40 percent of the world’s economy. Negotiations have been going on for five years and include establishing common standards for 12 countries, headed by the US in addition to Australia, Brunei, Canada, Chile, Japan, Malaysia, Mexico, New Zealand, Peru, Singapore, and Vietnam. Earlier this week, acknowledging global opposition to the Trans-Pacific Partnership (TPP) because of the agreement's "undemocratic pedigree,"Alfred de Zayas, the UN's independent expert on the promotion of democratic and equitable international order, said the trade agreement "is fundamentally flawed and should not be signed or ratified unless provision is made to guarantee the regulatory space of States."